The equine Matty continued his terrific spring preparation with another strong win at The Valley. 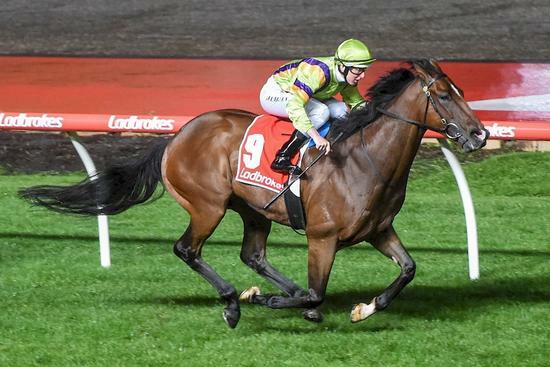 Matty won a Benchmark 70 race at Cranbourne two starts back before getting home in Benchmark 84 class in a leg of the 955m Challenge. Jockey Damian Lane had the task of getting Matty out of the gates quickly from the inside draw, which can be a problem for horses over the short courses at The Valley and completed the task with ease to get the gelding to the lead soon after the start. Lane rated Matty perfectly in front to the home turn before the son of Nicconi sped clear to score a comfortable two-length win, his fifth in 12 starts. Co-trainer Simon Zahra, who trains Matty in partnership with Mathew Ellerton, said The Valley suited the speedster’s racing style. “All his best runs to date have been here at The Valley,” Zahra said. “We were a little bit worried when he drew barrier one, but he jumped well, and he likes a bit of room. “He got his own way in front and had a nice kick at the end. Matty’s impressive win earned connections another $30,250 winner’s cheque, taking his stakes tally to more than $116,000. Congratulations to Matty’s terrific bunch of owners and all involved with the sprinter’s latest win.